When we speak about the bestselling automotive brand across the world Toyota undoubtedly reserve the top spot. Whether it is a Toyota car, van, Ute, commercial truck, 4×4 drive, crossover or any other vehicle. It is increasingly popular for being absolutely reliable and durable. This is a prominent reason why people love using Toyota vehicles, whether it is for personal or business use. Even when it gets old after giving years of good service the owner can expect to make good money out of it. That’s true. 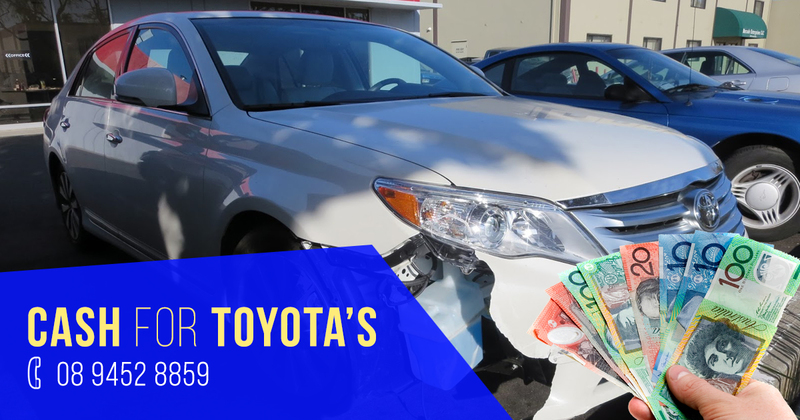 You can find many viable options through which you can sell your old Toyota car, van, light truck or other automobile for the best price, Toyota Wreckers Perth is one of the great option. One of the best and tried ways for scrapping your old vehicle in Perth is calling up the Perth Auto Wreckers. We are a friendly team of the removal experts offering free Toyota removals all throughout Western Australia. Once you dial our easy phone number: 08 9452 8859, all your trouble regarding unwanted auto removal will vanish. How we can help you to sell your Toyota? We are good folks saving people from the stressful and expensive job of selling a vehicle. We all know keeping and maintain an old or damaged vehicle is always very expensive. If you are delaying to sell your old vehicle, then you are inviting more troubles for yourself. As keeping a worn-out vehicle will only make you pour more money on its repairs and fuel costs. Don’t forget about the headache and stress it will cause you. This is where you can look up old car buyers to help. We provide an easy sale process combined with top cash. You can be anywhere in Perth but we will give you a free Toyota pickup plus removed from your place. Owning and driving the stylish Toyota vehicles is both beneficial as well as enjoyable. However, when it break down and become non roadworthy it is smart to sell it off. Don’t worry if your automobile is unsafe, uneconomical and in a terrible condition, including flooded, broken, scrap, damaged, wrecked, or busted. We pay fair cash for every condition of Japanese vehicle. Aurion on a regular basis. Our professional team pays good money on the spot. We cannot mention all the popular Toyota models that we buy on daily basis however, you are most welcome to get in touch with us and we would be please to help you with that. We don’t only help people in getting rid of the stress of having a scrap or unwanted automobile. We also help people financially by paying a set amount of cash. When you unfortunately need to sell your old car for cash you can immediately contact us. The cash we offer will be based on all such important factors as the make, model, age and state of your automobile. We buy cars as is means we don’t worry about the condition of the vehicle. We give best car appraisals for free. This means you will get accurate cash quotes without obligation. However, this is not the only perk you are going to enjoy after choosing to deal with us. You can request a same day auto removal service from our skilled and friendly team. We can arrange a quick and hazard free pick up from your place anywhere in Western Australia. You can organise a fast and convenient auto removal service over the phone. Or, use our simple web form to receive an online valuation. Being a well-versed team of Toyota wreckers we never leave any unwanted vehicle rotting in the yard. After towing it to our yard, the first thing we do is recoup all the components that are fixable. Our experts make sure to check if they are in a condition to be restored. Once they are recycled and tested efficiently, we sell them as second hand parts at inexpensive rates. In Perth, we own a vast inventory of top quality parts and accessories for Toyota automobiles. At your local car scrap yards, we recycle all the Toyota automobiles, which are beyond fix ups. We have dealt with all the totalled, accidentally damaged, unwanted or non-running vehicles but now, this is a good time to recycle automobiles for good cause.